For twenty years I have worked with them, played with them, worshipped with them, and taught their children; but their work world is as foreigh to me as the streets of Paris. "Code &, Radcon, 290, 457" are an alien language that my closest friends toss around. You can't live in Kitsap County without rubbing shoulders with shipyard employees, whose world is surrounded by fences and is filled with security codes and regulaions. Today, Esther and I stepped into their world and got a glimpse. Our good friends, Tom and Peggy Gilliard invited us to a kind of 'open house.' We had to be cleared ahead of time to be on the list of guests. This kind of thing does not happen very often, so we jumped at the chance. We obviously couldn't take a camera. Aside from seeing where Tom and Peggy worked (in the same building), the highlight was boarding the nuclear submarine USS Alabama. We waitied in line a long time, but it was worth it. 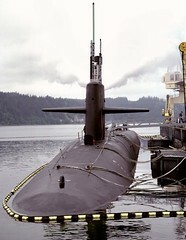 To crawl through a working nuclear sub, the most lethal machinery on the planet, is a little intimidating. It was great having Tom as a personal tour guide, as he was stationed on a nuclear sub for four years, and teaches nuclear safety to shipyard engineers. I have a little more understanding now of the world in which so many of my friends work. Thanks, Tom and Peg!